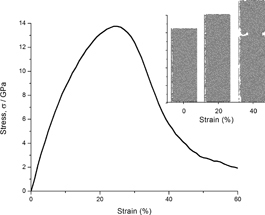 The local structural arrangement of the amorphous alloy system Al45Ni50Co5, subject to uniaxial tensile strain, was investigated using molecular dynamics simulation. The amorphous phase of the alloy system did not change in the process. The degree of icosahedral order quantified by the Honeycutt-Andersen structural type, 1551, plays an important role in the formation and expansion of the shear transition zones in this amorphous system. The structural types 1551, 1441, and 1661 are found to evolve during the deformation process.